Balkan Soul hostel is located in the oldest, charming but urban part of the city called Kosancicev venac. The main pedestrian zone - Knez Mihajlova is only a few steps away. Kalemegdan fortress is just around the corner and if you decide to experience the nightlife of Belgrade you just need to take the stairs down to the famous alternative district of Savamala, as well as the popular river clubs that work until the morning hours. We are just a few steps away from all the attractions, but we are at the same time hidden in a peaceful area with cobblestone and linden trees. 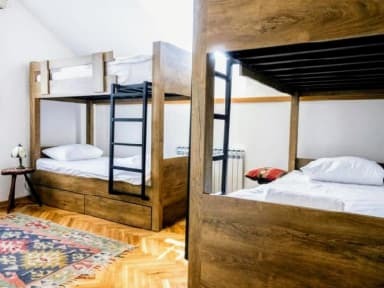 Balkan Soul is fully equipped with new bunk beds, a kitchen and bathrooms. Make yourself at home in our spacious bedrooms with big lockers, drawers, shelves and lamps for each bed. Our Soul room is our biggest treasure. Soul room is especially designed for our guests as a place where they can get to know each other, relax, mingle, and often watch concerts, movies and live sports events on the big screen. It’s an escape from the busy city lifestyle right in the city center, hidden, cozy and tasty furnished. Have an amazing walk at the banks of the rivers Sava and Danube, explore the Belgrade fortress, be amazed by the famous nightlife of Savamala and river clubs just around the corner, enjoy our typical Serbian food around the main pedestrian zone. Explore everything that Belgrade has to offer, feel the good vibe and chill in our cozy common area. Balkan Soul family is waiting for you! Check in at 14:00 but if guests arrive later they will be checked in until midnight the same day. If guests arrive between midnight and 2 pm, they are allowed to use common areas, stay at the hostel and wait until the check-in time. City tax is not included in price. Cost of the city tax is 159 RSD Serbian Dinar (around 1.35 EUR) per person per night. In the summer months we organize our own FREE WALKING TOURS OF BELGRADE & PUB CRAWLS! 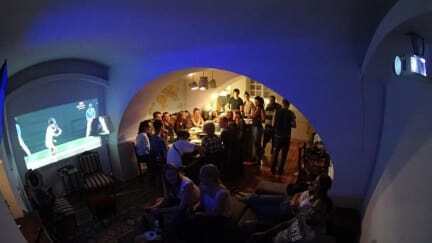 Perfect hostel, great staff and owner, chill common room and very well situated. Everything is really nice and clean ! Nice people, really helpfull, good vibes in Balkan soul ! The location is great also ! Thank you ! I loved my stay at Balkan Soul Hostel! The staff was absolutely lovely, friendly and helpful. Very great people there too, great setting & atmosphere too! Really recommend this place and would stay again if u return to Belgrade!! Top poeple,top place. Couldn't wish for better. I recommend and will be back. Bon rapport qualité prix. Le personnel est très accueillant et chaleureux toujours disponible pour répondre aux questions ou discuter avec les voyageurs. Seul petit bémol c’est le bruit. Les chambres ne sont pas bien insonorisées du tout pensez à prendre des boules quies ! Good hostel.. Very typical of a good quality big hostel. Try not to have the dorm on the basement. Very good hostel. I would recommend it. Du vrai n’importe quoi. On arrive à l’hostel, le gars sans jamais lever ces fesses de bureau, les yeux scotchés sur son ordi nous pointes approximativement du doigts: cuisine, chambre, toilette. Et nous dit juste que nous devons patienter pour nos chambres. Grosse attente de 9h du matin à 16h. Après nôtre chambre en question était correcte. Niveau sécurité, la porte principale presque 24h/24 grande ouverte et personne à l’accueil. Du coup l’hostel est un vrai moulin niveau passage.